This is a bright 17th century icon from the Church of the Nativity in Arbannasi, Bulgaria. There are two themes represented here. The larger part shows the naming of the animals by Adam with God looking on and blessing them, and the smaller part shows God creating Adam. This icon is in a simple folk-style manner, unlike the more formal icons in the Bulgarian culture and history. In icons the depiction of God before the Incarnation still shows only God the Son, the Second Person of the Holy Trinity, shown here in the form of the Ancient of Days that He appeared before He was born on earth. Because no man has ever seen the Father except the Son, the Church only shows God before the Incarnation in this form, or in the form of the Three Angels Who visited Abraham and Sarah before the oak tree in the plain of Mamre near present day Hebron. Since we say in the Creed of confession of Faith that by Jesus Christ “all things were made,” it is also theologically consistent to depict Christ as the Ancient of Days as the Creator. 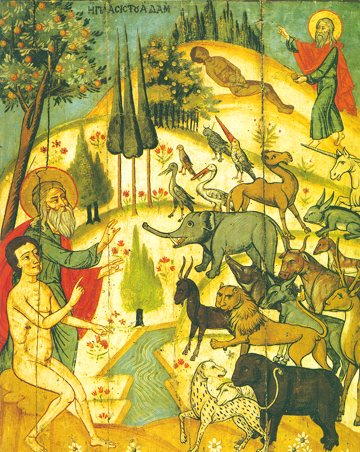 The animals peacefully look towards both God and Adam, for both God and Adam know their true natures.